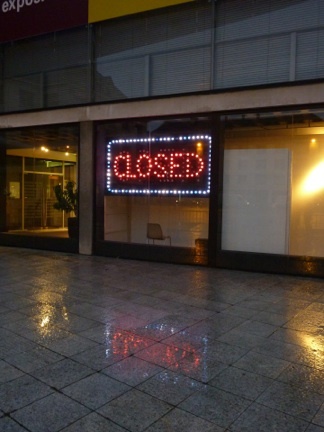 On the façade of the Maison de la Culture in Amiens, Panayiotis Michael has installed a illuminated sign made up of several coloured bulbs which, turn by turn, shows the words “open” in red letters with a blue outline, then the word “closed” in yellow, like those signs placed in the doorways of shops to show whether they are open or not. The two words follow one another at a slow pace. This large illuminated sign can be seen from far away. By appropriating the commercial style, which guarantees improving the daily round thanks to consumer goods, Panayiotis Michael explains that Open refers to people’s expectations, and their hopes for a change in their daily lives. 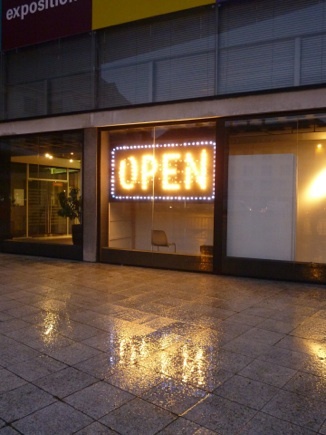 The busy and ostentatious aesthetics of this illuminated sign, which is usually an invitation and an appetizing summons made to the customer, can also be perceived here as an imperative; the word “open” thus also becomes a watchword, an exhortation to transform a situation. These works also evoke the situation in the closed part of the town of Famagusta, the total division of Cyprus, and the condition of each and every currently closed space resulting from specific political situations. If the commercial aesthetics of this sign complicate the hope of openness, because it is merely borrowing a system which involves selling illusions, Open also reminds us that the imaginary, like the poetic, are both subjective forces for constructing a change. Thus installed above the entrance to the Maison de la Culture, Open also causes us to think about the link between culture, commerce, and the invitation to change the state of things, in an imaginary or tangible way.